Click here for the ferry discount! Holidays in Sardinia at Camping Cala Ginepro, surrounded by pure nature! 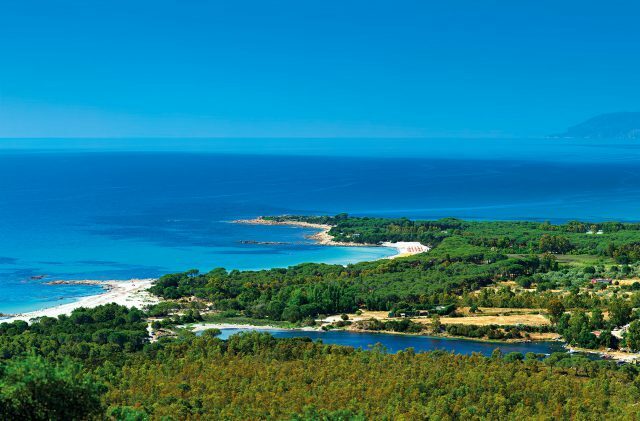 Camping Cala Ginepro, a place like no other for your Sardinian holiday, is located amid beaches of rare beauty, lush pine forests and fragrant juniper trees. Camping Cala Ginepro is a 3-star seaside campsite on the eastern coast of Sardinia, nestling amongst the pearls of the Gulf of Orosei. Facing out over the crystal-clear water, the campsite has three paths that lead directly to the shore: two to the fine white sand of the Cala Ginepro and Sa Mattanosa beaches, and one to the evocative reef. The pristine water, the shallow seabed that slopes down gradually and the extraordinary natural environment together make Cala Ginepro a destination beloved of tourists from across the world. Camping Cala Ginepro is the ideal seaside campsite for all those who are passionate about sport, nature, healthy fun and total relaxation. Special deals now available for ferry crossings! If you have booked your stay at Camping Cala Ginepro for 2019, you can request a discount code for the crossing. Click here for the discount code! Mostly shaded, the campsite’s thick pine forest is ideal for those who love outdoor holidays: in a caravan, camper van or tent of any type, including air camping. If, for your Sardinian holiday, you’re looking for the ideal mix of comfort and nature, you can choose one of the campsite’s bungalows/mobile homes, which can accommodate up to 5 people and can even come complete with a toilet, a TV set and air conditioning. Whichever set-up you prefer, we are on-hand to provide information and make recommendations. If you love peace and quiet, and you want to immerse yourself completely in nature, we recommend Camping Cala Ginepro in spring and autumn. April, May, June, September and October are characterised by their mild climate. Moreover, the beaches are less crowded, and there are myriad options for exploring the surroundings or indulging your passion for sports. Summer is, of course, busier, but it is also the season that sees most events being staged at the campsite, including live music and entertainment on specific evenings during the week, from 15 June to 30 August. From April to October, the three seasons of spring, summer and autumn flow by at Camping Cala Ginepro. We look forward to seeing you whenever you want to come – rest assured we are always ready to give you the warmest of welcomes. At Camping Cala Ginepro, we have invested in a plethora of facilities for your holidays in Sardinia, including: hot showers; restroom facilities with soap and changing tables; barbecues; pitches with power supply nearby; a wi-fi zone at the bar and an in-house debit card for all payments; pedestrian walkways to the beaches and car parks in the communal areas. And in summer, if you want, there is an entertainment service to make your holiday even more fun, with games, sporting tournaments, excursions, shows and live concerts. During your holiday in Sardinia, at Camping Cala Ginepro you can choose from all manner of different options, such as the mouthwatering dishes served up at the restaurant/pizzeria, with table service and take-away options; the large bar offering drinks, snacks and artisanal ice cream made on-site; and the market selling fresh produce and regional specialities. In addition, you can hire canoes, pedalos and windsurfing equipment, as well as mountain bikes for men, women and children, to allow you to discover the wonderful surroundings and make the most of an active holiday. Moreover, you can take advantage of assistance from the certified guides, who can accompany you on a variety of on-demand excursions. Click on the icons below to discover all of the services and facilities on offer during your stay at Cala Ginepro!